Our relationships with animals often end up taking on a human dimension, whether through conversation or the simple act of giving them a name. But how would these relationships change if we gave animals the skills to interact on a “human” level? 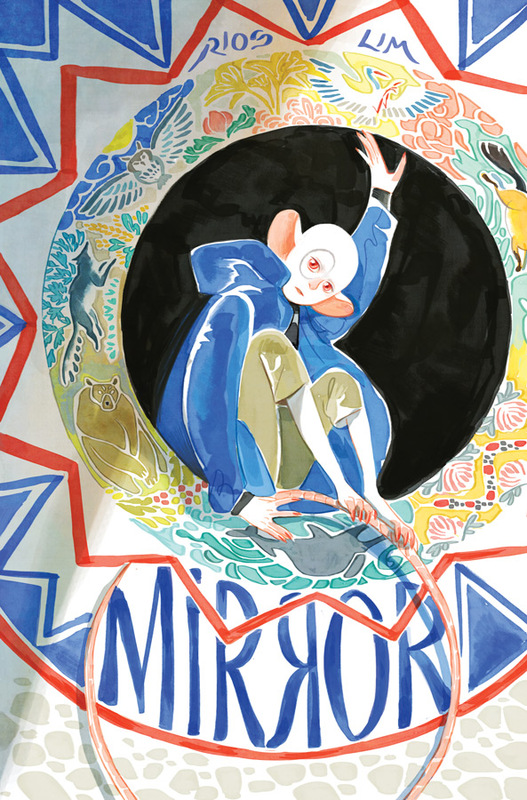 That’s the question at the heart of Mirror, the new series from Emma Ríos and Hwei Lim set in Brandon Graham’s 8House shared universe. Like Ríos’s artwork on Pretty Deadly, Mirror is a unique blend of genres with a heavy philosophical focus – one that showcases her talents on the other side of the creative aisle. Malaysian artist Hwei Lim combines understated but impactful pencils with a naturalistic color palette to breathtaking effect. Her complex page layouts add an even greater depth to this multi-faceted tale. 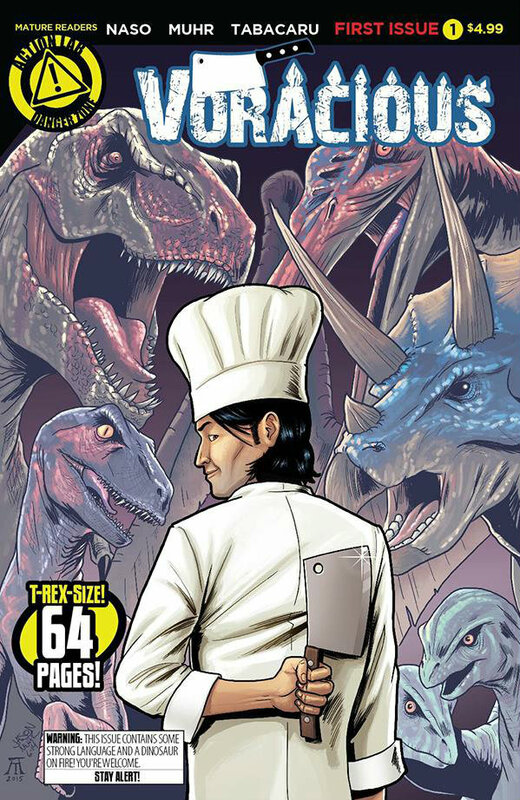 As a former journeyman cook for almost half of my life, it was extremely difficult not to get a little excited when I read the preview for Action Lab Entertainment’s Voracious, by talented newcomers Markisan Naso and Jason Muhr. Okay, a lot excited. What’s not to love here? When former big-city chef Nate Willner returns home to Utah after a tragic loss that causes him to question his career path, he unexpectedly inherits a technological marvel that allows him to travel into the past. There, Nate sees nothing but opportunity – the opportunity to create dishes of culinary artistry from beasties that haven’t walked the Earth for millions of years. While there may be a moral consideration or two that escape Nate’s notice, how could any self-respecting chef pass up the chance to put triceratops on the specials board? Nom. Nom. Nom. Keep an eye out for Muhr in the coming year: his artwork is phenomenal, bringing to life the distant past with a lushness and ferocity that’s all the more stunning when you consider Voracious is his first real long-form comics work. Markisan Naso (W), Jason Muhr (A) • Action Lab Entertainment (Danger Zone), $4.99/$5.99 (Variant). Typically, I’m not a huge fan of talking animal comics. Outside of the manic adventures of Bugs Bunny and Daffy Duck, anthropomorphism never really resonated with me, even as a kid. But that isn’t to say there haven’t been some stellar examples of well-crafted, sophisticated anthropomorphic works produced in the comics medium over the years. Kurt Busiek’s The Autumnlands and Bryan Talbot’s Grandville series immediately leap to mind. And who could discount Canales and Guarnido’s Blacksad? Following in this grand anthropomorphic tradition is the latest release from Ryan Ferrier (Curb Stomp) and Daniel Bayliss (Translucid). 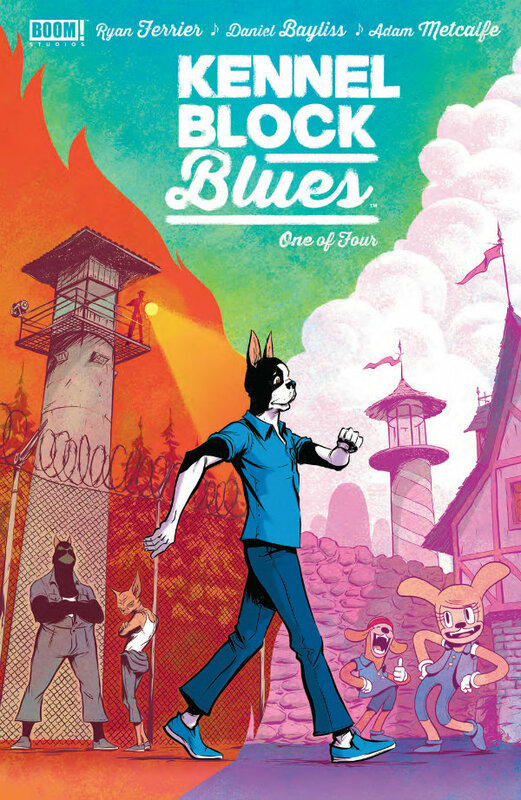 Kennel Block Blues is a prison drama unlike any you’ve seen before. When staunch family dog Oliver is inexplicably incarcerated on trumped-up charges, he finds himself awaiting a lethal encounter with the dreaded Table on Jackson Kennel’s death row. What’s a poor dog to do? With no hope for escape in sight, Oliver retreats inside, finding refuge from despair amongst a collection of imaginary cartoon friends. What ensues is a madcap, musical journey into the psyche of a dog trapped not only by the walls of his prison cell but by the confines of his own imagination. Ryan Ferrier (W), Daniel Bayliss (A) • BOOM! Studios, $3.99. 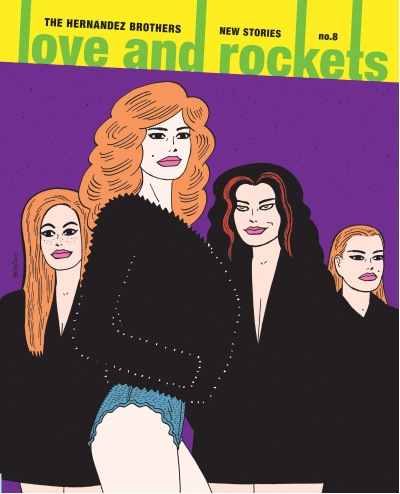 T he latest format for Love & Rockets continues with its eighth sort-of-annual volume, bringing a collection of brand new stories from the Hernandez brothers. Maggie and Hopey continue their road trip to the punk reunion, where they’re reacquainted with some familiar characters. Lots of old friends and enemies make an appearance in the second chapter of this latest Locas epic. And also from Jaime, we find out what happened to Princess Animus. The film may have broke, but the movie is just getting started. Then Gilbert brings us the conclusion of ‘The Magic Voyage of Aladdin’ story arc, which established the rivalry of his two star characters, Fritz and Mila. And to make matters worse, the Fritz look-alikes are starting to come out of the woodwork. With a host of new creations as well as new layers revealed for classic characters, Jaime and Gilbert are keeping their Locas and Palomar storylines (which they started in the early 1980s with the underground comix movement) as relevant as ever. 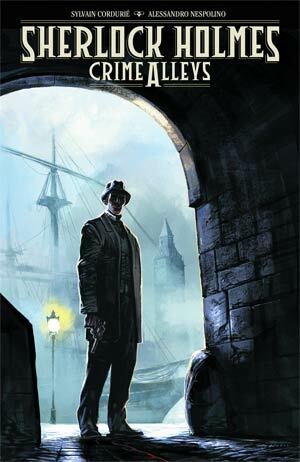 Writer Sylvian Cordurie is joined by artist Alessandro Nespolino for Dark Horse’s latest Sherlock Holmes mystery, Crime Alleys. Following the success of Sherlock Holmes and the Vampires of London (2014) and Sherlock Homes and the Necronomicon (2015), Cordurie returns Holmes to England and provides the detective with a disturbing case: members of England’s literati are disappearing without a trace and no offers of ransom follow. The mastermind behind the abductions promises to be a cunning foe for Holmes and Watson. Not surprisingly with a mystery story, Dark Horse has kept deliberately mum about the rest of the plot, but if it’s anything like Cordurie’s previous works, we can expect a solid story with a supernatural twist or turn. This is the first Sherlock Holmes book for veteran Italian artist Alessandro Nespolino, who made his comics debut in 1994 after attending the International School of Comics in Rome. 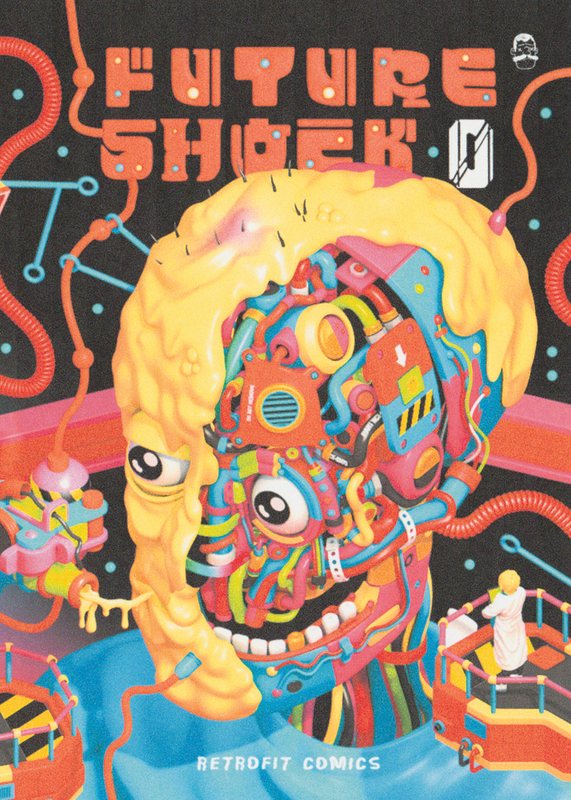 After seven issues edited and published by Josh Burggraf, the “Astro-Psyche-Out Sci-Fi Anthology” Future Shock has returned in chunky book form, as the latest impressive title from Retrofit Comics/Big Planet Comics. In truth, the “sci-fi” theme is only very loosely played out, although a lot of the weird and wonderful work certainly fits the “psyche-out” bill. This is a first-rate anthology of new work from some of contemporary comics’ most interesting voices, including Ignatz-winner Sophia Foster-Dimino, Pat Aulisio, Victor Kerlow, Anuj Shrestha, Ben Urkowitz, Will Cardini and Lala Albert. At 136 full-colour pages, behind a cover by Jordan Speer, this highlights the scale and ambition of what Box Brown (Retrofit) and Jared Smith (Big Planet) are doing, and provides further evidence that their annual subscription is one of the most rewarding bargains in comics.